exploration, appraisal or field development. Running under Windows operating systems HIIP™ is a Java-based software package. Easy to use and portable, HIIP™ can be run on laptops or desktop PCs and is ideal for rapid testing of volumetric scenarios. Whether in the office or data room, HIIP™ is an essential tool for geoscientists, working on anything from new ventures to mature assets. HIIP™ allows the user to create or load existing depth maps and generate multiple geostatistical realisations of depth structure in order to estimate the full range of depth and volumetric uncertainty over a particular area of interest. A comprehensive set of geological scenarios can then be tested very quicky to come up with GRV Uncertainty distributions. 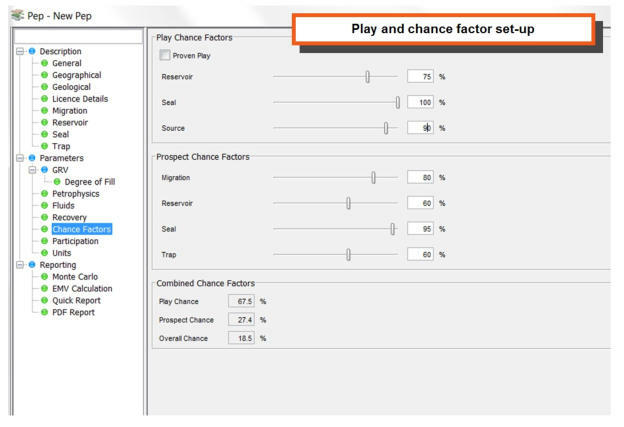 Play and prospect risk factors and probability distributions for petrophysics, fluids and recovery can be set in order to make probabilistic calculations of HIIP (Hydrocarbons Initially In Place) and Reserves. 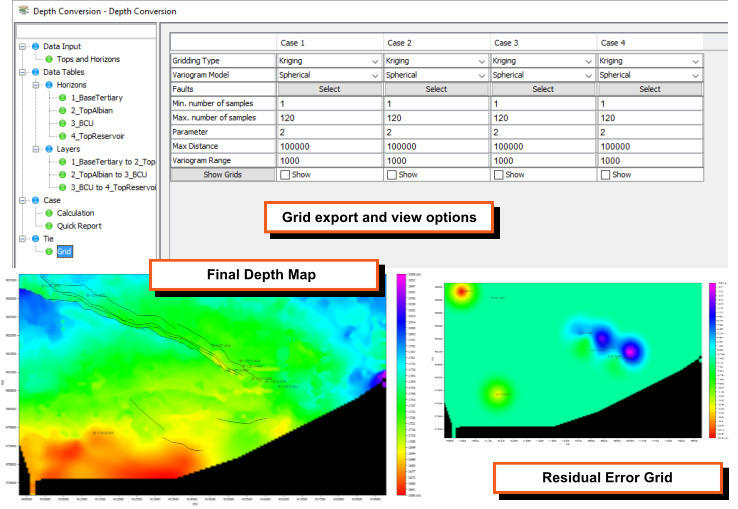 Features of the software include: • Single and Multi-layer depth conversion • Automated fitting of complex DC functions • Automatic closure & spillpoint calculation • Connectivity & fault-seal sensitivity: Test and constrain • Amplitude conformance with structure • Fast geological scenario testing • Unbiased geostatistical ranges • Non-conditional simulation for exploration targets • Reliable uncertainty recognition and estimation • Prospect evaluation and reporting HIIP™ from Earthworks Reservoir Developed over the last decade and a proven technology within Earthworks Reservoir’s consultancy portfolio, HIIP™ was commercialised in 2008. 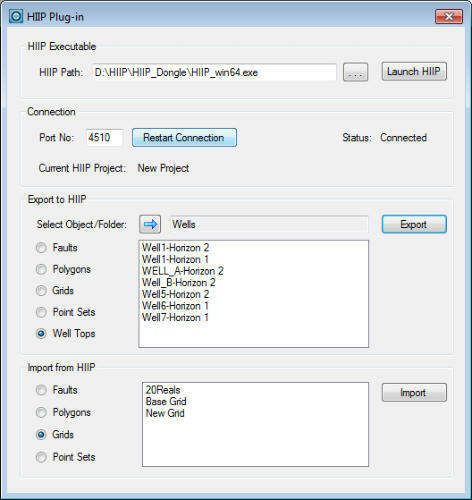 Providing a statistically robust tool with a simple and efficient workflow, HIIP™ has moved from strength to strength. Continuous dedicated development has seen HIIP™ gain and hold market position as recognised technology for depth conversion and volumetric uncertainty uniquely combining advanced depth conversion with stochastic subsurface analysis. Utilising a modular workflow and project tree format, HIIP™ has been designed with you the user in mind. Focussed and customer driven development result in a smooth, efficient and intuitive tool. With a streamlined licence structure, HIIP™ delivers a sound technology without the worry or complexity of varied licence options. Workflow Management The interface is built around a tree structure, rather like a file manager. Each branch of the tree represents a scenario. New scenarios can be created by cut and paste, either of an entire tree or selectively to add new components. Scenarios can have multiple branches, thus allowing what-ifs? to be constructed, for example attaching several different reservoir layer models to a gross rock volume geological scenario and calculation. Data Import and Export Depending on the analysis, the user can choose to load a number of different data types including point sets, grids, well locations, formation tops, faults and polygons. 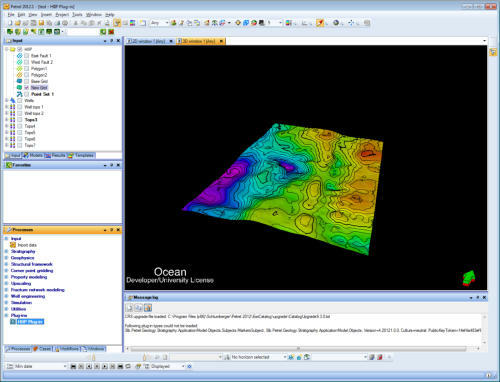 These data may be used to constrain volumetric computations, be used as input for mapping or geostatistical simulation within HIIP or simply for display purposes to represent a prospect and associated licence boundary and well data. Many data types are supported, both for input and export. Popular grid formats include: • Generic X Y Z loader • Zmap (LandMark) • CPS-3 (GeoQuest) • Irap Classic (Petrel) • Isatis Utility Capability HIIP has a comprehensive set of Utility functions for both data preperation and QC. These include: Gridding & Utility: • Median filters can now be applied to a grid to remove anomalous values with changing the structure of the grid • A brand new morphological operations module has been added allowing the user to process and filter noise from amplitude grids o Options such as ‘close’ and ‘open’ give the user flexibility to remove noise and anomalous values from the fringes of amplitude anomalies while also accounting for amplitude area lost due to tuning/ thinning of the reservoir • Upgrades and improvement to Petrel data bridge • Development of grid cleaning/homogenisation tool which takes any grids which may have different extent, sizes etc and creates a clean, common geometry stack of grids with user defined truncation with layer priorities. This tool is designed to provide significant upgrade to grid preparation for depth conversion and (externally) seismic inversion. • Proportional horizon generation tool to generate sub-horizons between horizons. DC - Depth Conversion Module HIIP has a comprehensive and fully featured Depth Conversion (DC) module available as an option. The DC module has data analysis and function fitting capability combined with a convenient tool for comparing depth conversion cases and identifying optimal solutions. • Significant performance improvements throughout the depth conversion and improved management if very large well data sets • Apparent velocity grids for any interval/method can now be generated for any depth conversion function and saved to the work tree, intended for use in 3rd party depth conversion packages • An intermediate tie can now be applied for a V0+Kz. Shift the preceding horizon by the mean of the depth residuals at the well to ensure the velocity at top of layer is more accurate • Residual reporting inlcudes well XY coordinates • Major upgrade to automatic fitting of V0+kZ velocity functions. Legge&Rupnick fitting has been extended and is no longer restricted to layer1, so automatic V0+kZ function fitting allowed for any layer o Function fitting can be optimised from any horizon as reference level, not just datum, so functions can fitted with reference to seabed/mudline for example o Error residual data and optimal V0 as a function of velocity gradient k stored and can be displayed for every layer V0+kZ function o If user over-rides k value in any layer, program can still identify V0 from error residual function and populate interface with optimal V0 to match user-defined k. • Additional statistical information on crossplots including coincident sample mean calculations • Residual data at any horizon in depth conversion can be stored to the HIIP data tree as a point set for further analysis or kriging • View/Export instantaneous velocity slice through any depth conversion function as % proportion of slice position with layer. Particularly useful for QC of function methods such as V0+kZ. 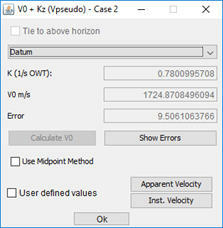 • View/Export velocity difference map across depth conversion interval boundaries to QC for velocity inversions etc. • Unique neighbourhood kriging has been included, particularly designed for well datasets and offering significant performance upgrades when kriging residuals • Kriging now recognises horizon null nodes in residual kriging, greatly improving efficiency HIIP’s depth conversion module allows the user to input TWT grids and depth convert them using a range of different methods from a wide variety of velocity data types as shown below. The DC module allows the user to associate the well formation tops (and well times) with the TWT grids and perform back-calculation from grids to the formation top intersection location with the grid. These data are presented in the Data Tables as the layer and horizon based times and depths for QC and analysis using the cross-plot and regression tools. Multiple depth conversion cases can be specified and compared side-by-side, changing the layer model and the functions or velocity grids within each layer. The depth conversion residuals and associated statistics are all compared simultaneously. • Area depth information can now be calculated based on hydrocarbon column height as well as contact depth • New Probability Distribution Functions (PDF), have been added so that area depth calculations on either contact or column height do not need to be treated exclusively as a uniform distribution o ‘Slice’ through your prospect and see the area-depth information obtained using functions such as normal, log-normal and triangular o A brand new beta function has been added o Advantageous to use as it is a bounded distribution (unlike normal etc.) 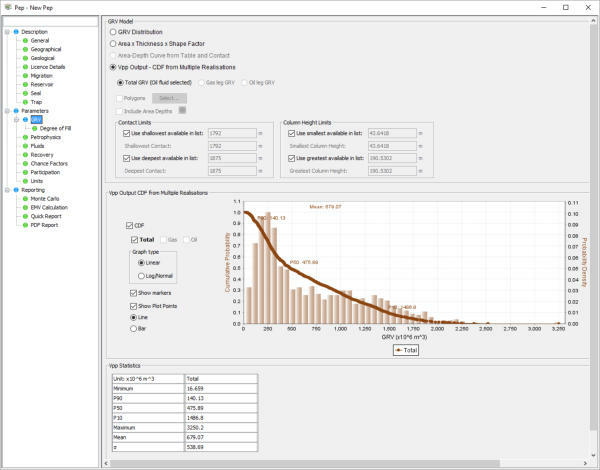 • A new layer model allows the stacking of as many reservoir or waste zone intervals as required for the prospect, allowing the building of a complex reservoir model for volumetric analysis The VPP module is the core interactive tool which allows the user to tackle any volumetric scenario. 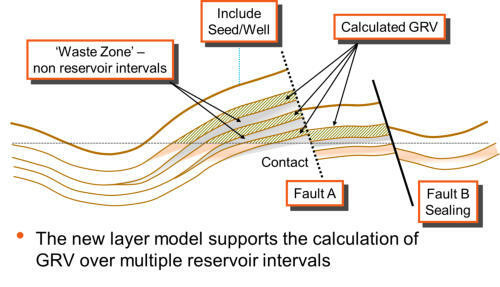 The geoscientist can specify “what if” scenarios taking into consideration possible fault seal, spillpoint, amplitude maps, contacts and stratigraphic trapping mechanisms as well as defining multiple reservoir and waste zone layers offset from the mapped horizon to the top reservoir. 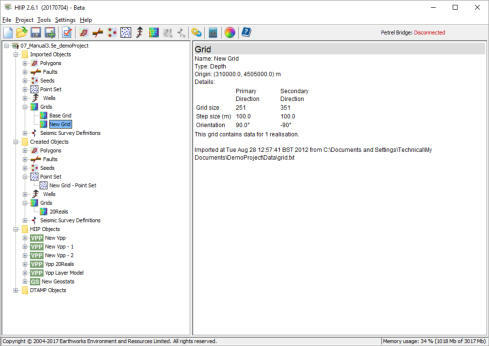 The grid input to VPP may be an existing deterministic top structure grid loaded to HIIP™, a depth converted grid generated within HIIP™ or you may have run multiple geostatistical realisations on either input using the GS module supplied with HIIP™. Whichever way, VPP rapidly computes volumes for your selected scenario. 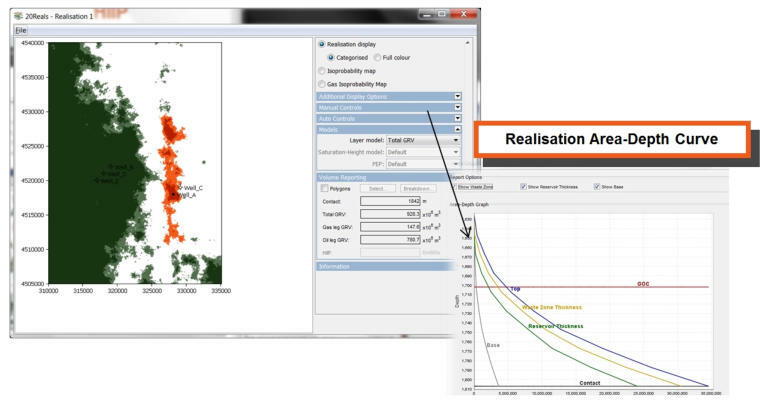 By setting up multiple Vpp objects, different geological assumptions can be modelled and stored. The scenarios you model in VPP are limited only by your imagination. You may have an oil or gas contact identified in a drilled well which you want to input. It may be a prospect yet to be drilled. You may have an oil-down-to (ODT) or water-up-to (WUT). All these (and more) can be incorporated into the scenario modelling . With a yet to drill target you can automatically compute the gross rock volume associated with the lowest closing contour. From the maximum fill you can then reduce the volume to account for partial fill by adjusting the contact or using the automatic area-depth slicing. 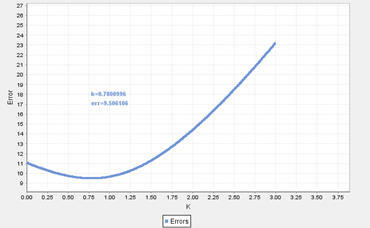 To run an automatic spillpoint (lowest closing contour) calculation the user defines seed points. An Include seed is a point inside of the field or prospect outline and an Exclude seed is a point beyond the field or prospect. A seed can be a well or a control point digitized on the screen interactively. After specifying include and exclude positions the connectivity and autospill functions determine the maximum possible size of the prospect. With multiple realizations the batch controller rapidly applies your settings to all realizations, automatically computing the volumes. • Automatic Lowest Closing Contour (Spillpoint) • Verification against known contacts and automatic rejection of invalid solutions • Connectivity and Compartmentalisation Calculations • Fault Seal Constraints • Isoprobability Closure Mapping • Area Depth realization displays • WUT/ODT Constraints • Column Height Constraints • Contact PDF uncertanty • Gas column height proportions • Amplitide conformance statistics and constraint Volume calculations can include multiple polygons, volume reporting can then be per polygon as well as total volumes. 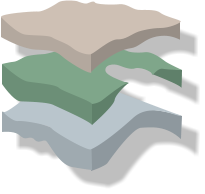 Reservoir layering can be introduced through the layer model option. The user can specify a constant or can use a thickness grid. Waste zones can also be included, to account for offset between the mapped structure and the top of reservoir / porous zone. Any number of reservoir or waste zones can be stacked. 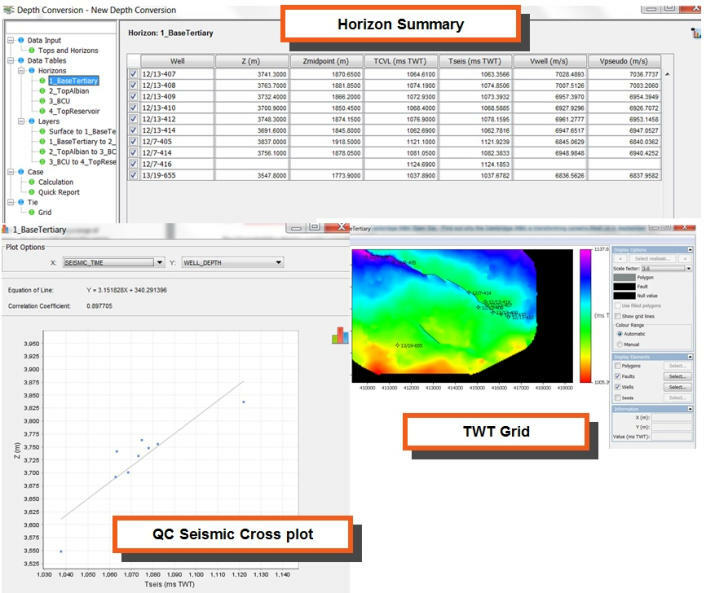 Base reservoir grid is also offered which allows truncation in the connectivity calculations and provides the means for defining stratigraphic traps. 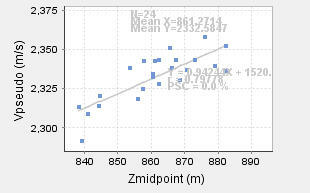 HIIP™ also allows sets of geostatistical realisations for the reservoir thickness, waste zone / or base reservoir. Stratigraphic traps can also be defined using faults as barriers. 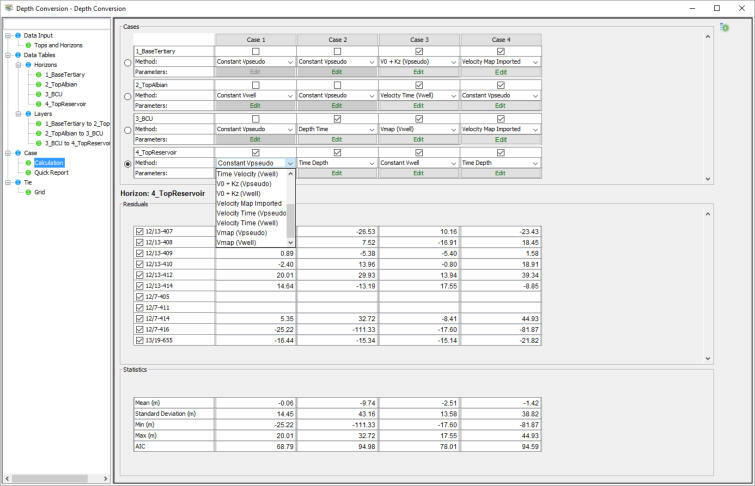 Using multiple geostatistical realisations as input the batch controller will automatically process all realisations and report the volumes from which P90, P50 and P10 probabilities can be calculated. In addition the Isoprobability closure map can be generated, showing the probability at any grid node of drilling within the closure. These maps, being based on connectivity, can also be used to estimate probability of structural dip compartmentalisation of the prospect or field. PEP - Prospect Evalaution and Risking PEP is a fully functional 1D Monte Carlo engine. 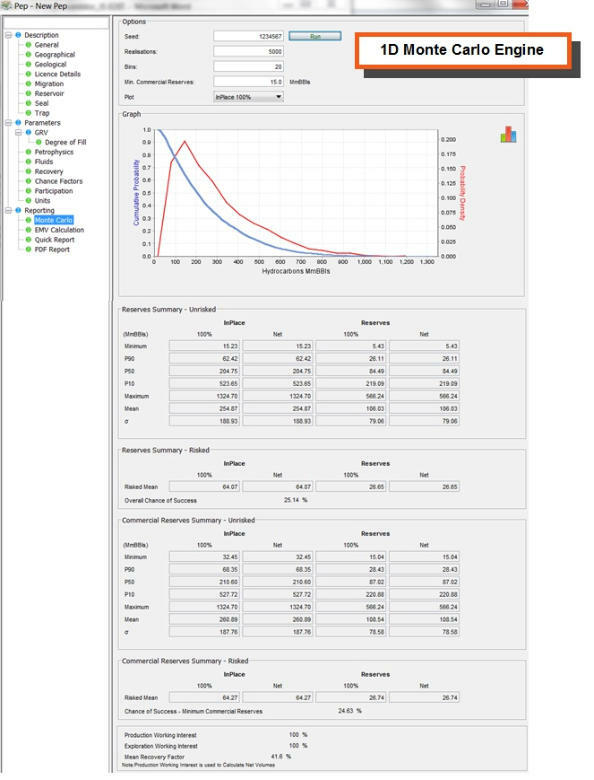 In HIIP™ PEP can be used in a traditional manner as a standard risk and uncertainty module, with user supplied distributions for porosity, net:gross, saturation, GRV and so forth, but it can also be linked directly to the grid data through Vpp. 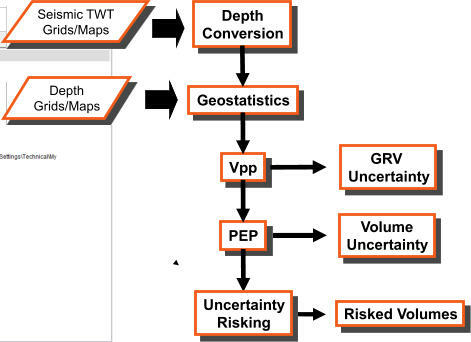 With GRV often the largest contribution to HIIP uncertainty, it allows information to be taken directly from the prospect map, with geostatistical uncertainty, into the PEP model. 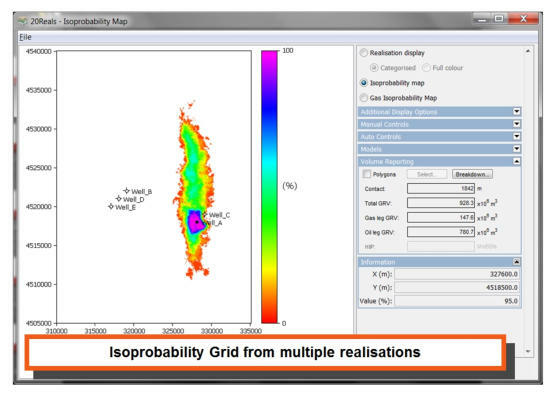 Merging Geostatistics and Prospect Evaluation The key concept in HIIP™ is to link the traditional 1D Monte Carlo Prospect Evaluation approach to the grids and maps produced during any sub-surface analysis. 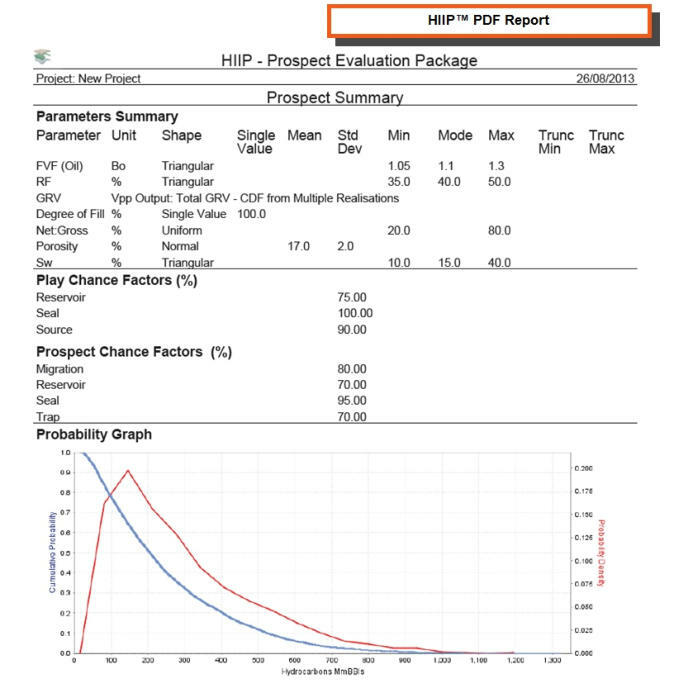 Prospects identified on digital grids can be input directly to the Prospect Evaluation. By using the output from geostatistical uncertainty modelling the GRV uncertainty can be passed to the Prospect Evaluation as a statistical distribution of gross rock volume. In turn, the prospect parameters such as reservoir thicknesses, waste zone thicknesses and base reservoir grids can be used to modify volumetric calculations on the grids.